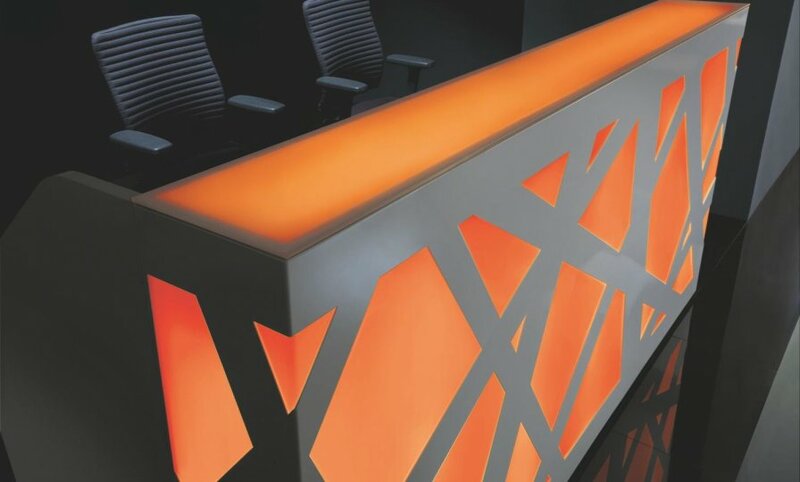 Zigger reception desks have an integral LED light system that is controlled remotely. Not only just a functional desk, but these reception desks will guarantee to become a decorative solution to your reception area. 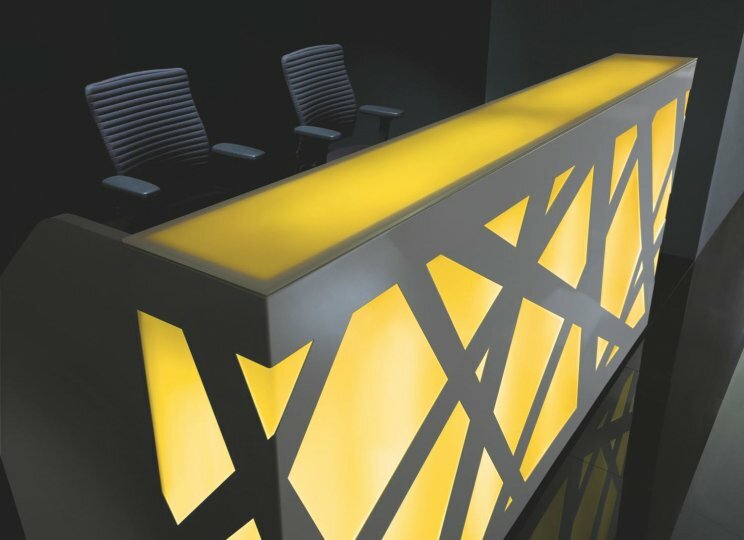 The lighting system within the reception desk really does make it unique as the user can affect and regulate the light intensity as well as the colour of the lights at the touch of a button. You are also able to select between static or constantly blending rhythmical colours. 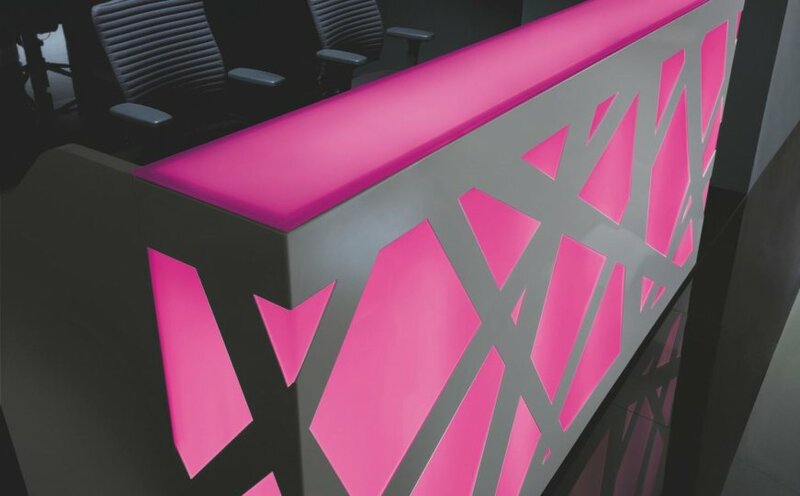 The front of the desk is made of durable White steel that is latticed and subtly wraps round the body and contrasts with the LED lights. The lights illuminate not only the of the reception unit, but the counter top as well. The lights sit behind plexiglass that completes the front look of this reception desk. There are a number of ways to get the most out of your reception area. You should choose a reception area that gives a true representation of your business. By using your company colours within the colour scheme of your reception area can help to give the room identity to the company. All successful businesses have seem to have something in common. If they have a reception area that they use in their office, you can guarantee that all of the receptions are professional looking and are a positive attribute to their business. The reason that companies do this is so that when a new visitor or potential client enters their office building, their first impressions are always positive because they enter a relaxed and inviting reception environment. If your reception area looks professional then any visitor will automatically begin to form opinions about your business and these first impressions can not be taken back. When refurbishing your reception area you need to make sure that you have a comfortable reception seating area as well as having an area to be greeted and this normally takes the form of the reception desk. With modular reception desks it is easy to create an interesting shape and configuration that is unique to your reception. The Zigger reception is modular and consists of different lengths of straight desks, low level and with counter tops, as well as options for DDA compliant modules. If your are having trouble trying to work out or realise your receptions full potential then we can help. Once we know the dimensions of your are, and more detail into the type and style of reception furniture that you require then we will be able to create accurate 3D visuals of what your reception area will look like. This service is completely FREE with no obligations. If you would like to take advantage of this fantastic service then do not hesitate to call our expert sales team that will be happy to take your call.